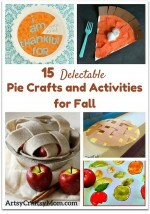 Celebrate the season of pumpkins, falling leaves and pie with some fun and easy fall crafts for kids! Includes owls, foxes, hedgehogs, apples and more!! Have your yards and gardens started turning orange, yellow and all shades of brown? After all, that’s what we expect this time of the year – for the world to turn to gold! Fall is an interesting season. It’s cool enough to dress up in warmer clothes but it’s still warm enough to play outside. Our vegetables follow the leaves’ colors, with pumpkin, squash, corn and others making their way to our tables. It’s the time for soup, stews and of course, pie! 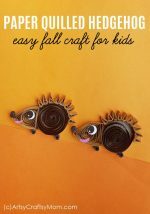 Fall is certainly a season worth celebrating, and we’re doing it here with some fun and easy fall crafts for kids. Whether it’s pumpkins, hedgehogs, apples or leaves – you’re sure to find it all here! This fall tree craft from I Heart Crafty Things is too gorgeous for words! The use of those paper strips to form the circles for leaves is just genius and gives the craft that lovely 3 D effect. Great wall art idea for the season, if you ask me! Give the little ones something fun to do this Fall while also fine tuning their motor skills. 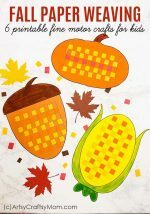 Check out these fall weaving printables in different cute shapes that are perfect for preschoolers. The idea of this leaf silhouette craft from The Best Ideas for Kids is really simple, but the result is quite impressive! Cut out bunches of yarn and stick them in order to make this style. You can also make a Washi tape version or one with paint scraping. Planning to give your teacher or friend a special card this season? Then make it impressive with this 3 D Pop Up card! With beautiful fall colors, this autumn tree card is easier to make than it looks! This Popsicle stick scarecrow from Crafty Morning is anything but scary and I wonder if it’ll keep the crows away! It’ll certainly attract lots of compliments though, considering he has quite a fancy, blingy hat on! When the weather changes, it’s time to do up your home in tune with the season. Start with your front door by making this pretty fall wreath with natural elements like pine cones as well as twine for a nice, rustic look. Just how pretty is this falling leaves snow globe from The Soccer Mom Blog? I can’t think of a better way to actually capture the ‘fall’ of leaves. The branch in the middle makes it look more real. Add some glitter if you’d like it a little more shiny. Want to recreate the beauty of a fall tree with different colored leaves? 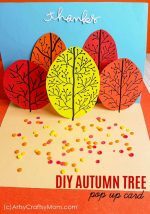 Then this paper quilling fall tree craft is perfect for you! This also looks great as a card or framed up on the wall. Did you know that foxes have excellent eyesight, much like a cat? Yes, foxes are pretty amazing creatures, and this paper plate fox craft is not so bad either! We know there are lots of owl fans out there, and there are no dearth of owl crafts too! But this little cupcake liner owls are too easy and too cute to not try out – so go ahead and make an entire family of them – use small liners for the baby owls. These handprint owls are so cute, and that little tree is perfect! Real feathers make the owls more realistic and the newspapers turn into awesome branches. Check out Best Ideas for Kids for the full tutorial. 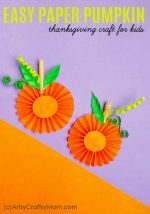 Whether you want to make a fall-themed card or want to decorate a gift you’re giving the upcoming festive season, these paper pumpkins should do the trick! 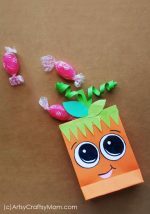 An easy craft for the little kids, challenge them to see how many they can make in a given time! Isn’t this leaf family absolutely the cutest! The folks at Homeschool Preschool have used faux leaves which are more durable, but you can also make ones out of cardstock and paint. Make as many as you like – include the whole family! It’s fall, which means your pretend play food station should reflect the seasonal change. Start off with a delicious pumpkin pie, topped with cream and ready to gobble up! Caramel apples are an irresistible treat, especially during Fall. This craft from I Heart Arts n Crafts reminds you of that lip smacking treat, especially since that puffy paint resembles real caramel! Have you spotted any hedgehogs out yet? We haven’t! So till we actually get to see some, let’s make do with this paper quilled hedgehog craft. By the way, did you know that the hedgehog’s spines are also called quills? Here’s a beautiful way to get a keepsake of a memorable Fall season – a fall leaf bowl! Emma Owl shows us how to use a big leaf to make a print on air drying clay so that you get a perfect, leaf shaped bowl. Don’t forget to paint it! Get ready to gather your treats for the festive season with this DIY pumpkin treat bag. Just look at those eyes – no one can resist dropping a treat or two into such a cute little bag! This craft from Krokotak is so much fun, I can imagine the whole family will be giggling! Draw faces of your siblings or friends and give them some cool or quirky hairstyles with autumn leaves. Use different colored leaves for a ‘colorful’ effect! If your little one is in the process of learning the alphabet, let’s go seasonal and learn that H is for Hedgehog with this craft! Use regular craft supplies to make this simple craft, with yarn bits for the hedgehog’s spines. Along with these fall crafts for kids, don’t forget to check out some awesome fall-themed art ideas as well – let’s try to capture the beauty of what we see around us in art! For a more sensory experience, try out some fall themed sensory bins for the little ones – they’re sure to enjoy it! Such a pretty art and craft to teach my kids. Thank you for sharing these wonderful ideas.